Is Daredevil dead, or isn’t he? While his fate might be undecided, the status of his book isn’t. A new team takes over this February. Just who Daredevil might be going forward isn’t clear. 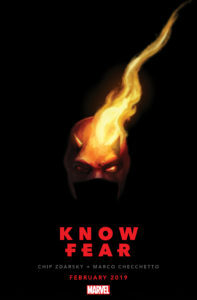 Is Matt Murdock still alive, or is someone new set to take on the moniker of Daredevil? In the wake of the Death of Daredevil storyline, we just don’t know. But fans of the iconic Marvel hero might not have to fret, especially if the press release is anything to go by. That’s because, from the sound of it, the devil of Hell’s Kitchen might not be done just yet. Check out the announcement below, as Marvel takes the wraps off of the new creative team of Chip Zdarsky and Marco Checchetto.